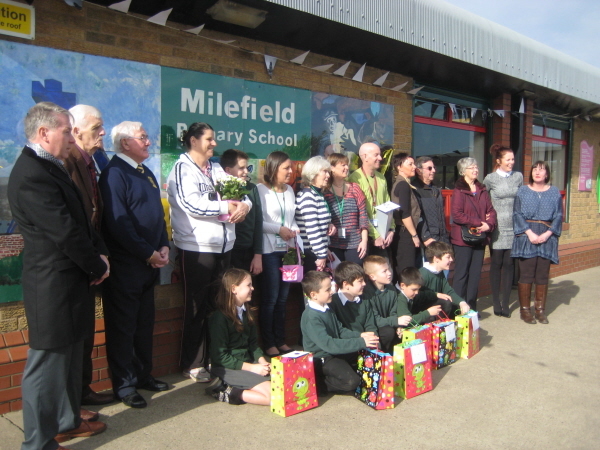 On Friday 7 March, two members of Barnsley Art on Your Doorstep attended the dedication ceremony for the artwork used as a name board for Milefield School, Grimethorpe. It was created by the parents, grandparents and children at the school in sessions arranged by Barnsley Adult and Family Learning Service. The work was influenced by the mining heritage of the village and the paintings of miner Samson Gilbert Daykin. Small awards were made to the children and their families before the ribbon was formally cut by ex-Grimethorpe miners. The work was unveiled to commemorate the 30th anniversary of the Miners’ Strike and dedicated to the miners of Grimethorpe. This was followed by tea and cake and a chance to talk to the children and families about their involvement in the project. Their pride in their work and in the village itself were obvious.